Mittetulundusühing Wikimedia Eesti is the official local chapter of Wikimedia Foundation in Estonia. 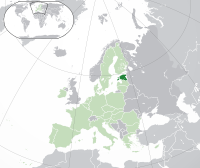 1) To support the collection, preservation and distribution of educational, scientific, cultural and historical data available under a free license, especially in Estonian and Võro languages and make more freely licensed information available about Estonia in other languages. 2) To support and promote projects which are managed by the Wikimedia Foundation, Inc., a non-profit organization in the United States. These reports are also available on the reports page. Description of staff job functions from October 2013 to June 2014. Wikimedia Eesti also signs contracts for temporary positions related to different programs and projects. Due to their changeability, these positions are not included on our Meta page. As decided by the board of WMEE on 19th of November 2013, Wikimedia Eesti follows the code of ethics of Estonian nonprofit organizations. This page was last edited on 24 October 2018, at 16:27.